This makes a splendid calzone – and at a fraction of the calories of a pizza shop one ! The cheese melts beautifully and the portion size was just perfect. 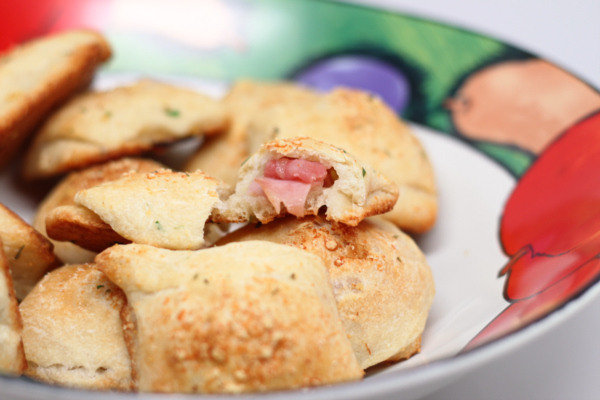 If you’ve never had a calzone before, it’s just pizza dough wrapped around cheese and other goodies – this one has ham, but some people prefer just cheese. Preheat oven to 425 degrees and spray a baking sheet with Pam. Mix ricotta, spices, parmesan. 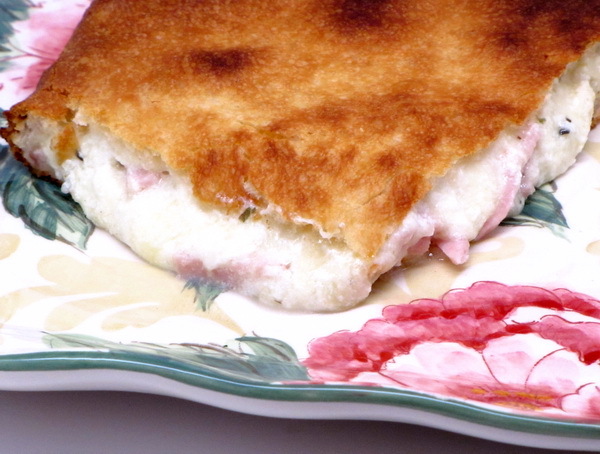 Mozzarella and ham. Unroll the dough and press it into a 10 inch circle or 10×12 rectangle. Spoon the mix onto one half leaving a 1 inch border and then fold the other side over and seal the edges by pinching the dough to secure. Bake 8 minutes then turn over and bake another 6 minutes. Remove from oven and let cool – then cut into 4 servings. Optionally serve with some low fat marinara sauce for dipping.